There’s nothing quite like the feeling of having bought and built your very own custom PC. Meticulously scouring the internet for the best deals and the most compatible RAM for your motherboard can be an arduous process taking many hours of your time. But once you’ve finally decided on a keyboard, a monitor, a CPU and whatever else you need, the feeling of completion is triumphant. But I am afraid to tell you that odds are you may have forgotten one last important component to your computer set up: a stand for your tower! PC tower stands are a great addition to your set up because of several benefits. Having your computer rest a few inches above the ground can make it easier to move and to clean. You may even have your fans or PSU installed in such a way that this will make ventilation more efficient. Plus, let’s not forget that it will make your work or gaming space look more organized. Below we have chosen three excellent tower stands, each with their unique advantages. We’ll go through how durable they are, how portable they are and help you decide which one is best for you and your tower. Monoprice is a fairly well known brand name with origins in the cable industry. They now offer a wider range of products including 3D printers, HDMI port hubs and even subwoofers. They even have laptop and monitor stands if that’s your fancy too. It is safe to say that this is easily the most appealing stand on our list. 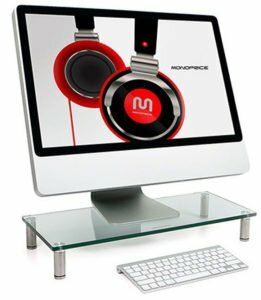 There’s no doubt that one of the main selling points of the Monoprice is its glass base as indicated by the many positive reviews on Amazon. The thick glass is held up by four aluminum legs that makes it look like a small coffee table. It has a simplistic look to it that makes it classy without being distracting. You can probably bet that just about any PC set up would look better instantly with this as your stand. Because of its transparent design it matches well in just about any room regardless of the style of floor, carpets or furniture accompanying it. If appearance really matters to you then you should heavily consider purchasing one for yourself. While we’re mainly looking at the standard transparent model, there are actually four different versions: aluminum, black, silver and clear. Black and aluminum are the only ones that are not transparent and may be a better fit based on what your room or even your tower looks like. The silver and clear models look like foggier and discolored versions of transparent which we personally don’t prefer but your tastes may vary. 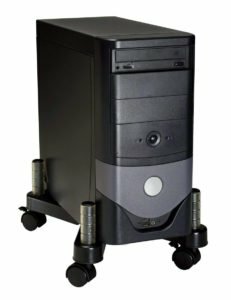 Some readers might be turned off by the fact that the Monoprice has no wheels, effectively making it too difficult to move around your computer. If you are the type who needs to move your tower on a consistent basis then it is clear that the Monprice will not give you the portability you are looking for. However, if all you need is to be able to lift your PC a few inches off the ground and don’t require any other adjustments then you should be fine. This stand has adjustable legs that alter the height of the table by screwing or unscrewing the four legs. This extra versatility really comes in handy if you ever wanted to store anything beneath the stand or simply need the extra space to make your cleaning easier. Versatility also applies to the actual dimensions of this stand. The Monoprice comes in several different sizes and you’ll certainly be able to find one that fits your PC tower’s size. You may even want a larger one to fit extra components such as speakers or video game controllers. The standard size is 22 inches by 9.5 inches, but you can also order their smallest size 19.5 x 8.5 inches or their largest at 30.8 x 11.5 inches. Additionally, the four legs are totally detachable if you ever need to put the stand in storage. They require no tools and simply need to be screwed on or off by hand. You may be surprised but this thick glass frame is stronger than it looks. We can’t imagine how heavy your computer would have to be to impede its infrastructure. We wouldn’t recommend standing on it by any means but the Monoprice can easily handle a couple dozen pounds. And since it isn’t even mobile in the first place the odds of it getting damaged are unlikely. You shouldn’t worry about cracks either as glass of this thickness is pretty hard to put a chip in. This is roughly twice as thick as your standard window and windows are designed to be durable themselves. Where the Monoprice had visual design the Kantek has mobile design. They’re a brand that excels at appealing to both casual and business based consumers. That means that you’ll be satisfied whether you want a stand that works for a leisure set up or something that will fit in on the job. As mentioned earlier, the Monoprice is certainly the most visually appealing stand on our list but that’s not to say that the others are not nice looking. The Kantec CS200B was designed for office cubicles and personal spaces. This stand certainly has more in common with the looks of older IBM desktops than the more flashy and modern gaming rigs that are more popular today. You might say it has a more early-2000’s vibe to it. The stand itself is shaped like an X though that shape is masked once a tower is placed on it. It’s not very distracting but that could easily be attributed to its drab and generic style. The wheels are a big plus when it comes to the Kantec. 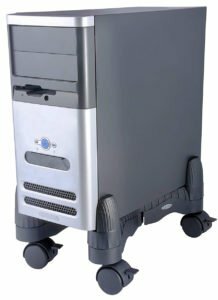 Moving your computer around on what is essentially a small trolley is safer and easier than sliding it across the ground or picking it up yourself. The wheels are much like the standard ones you find on office chairs or even certain appliances like barbecues. They remain sturdy on a variety of surfaces. And the wheels come with locks so you don’t have to worry about your expensive device rolling away on its own into oblivion as long as you remember to push the mini levers down. The Kantec does a great job of securing your tower to the stand. The four side brackets are adjustable and will tighten to a variety of sizes. The base itself is also perfectly flat adding extra security to the foundation of the entire mechanism. In other words, it would be very hard to have your tower topple over. Despite being made almost entirely from plastic, this Kantec stand is hard to scuff and damage. It is both light and easy to move but the internal structure is well designed. You’d have to throw this thing under some absurdly extreme conditions in order to really get any noticeable wear and tear out of it. The plastic hinges and swivel functions don’t get any looser over time either so you can rely on its internal mechanisms to hold up for as long as you need them to. The 3M has a lot more in common with the Kantec than the Monoprice. This is noticeable by the X-shaped structure and the inclusion of wheels. They may not be sporting cutting edge aesthetics but they certainly do care about delivering top-notch durability and functionality. The 3M is a little less drab looking than the Kantec. A darker charcoal is used for the base rather than the kind of grayish blue seen previously. The mounted cylinders add a little texture to the overall presentation though one might say they look more like out of place table legs than anything else. The wheels look identical to the ones seen on the Kantec, locking levers and all. Though the base has a more noticeable swiveling feature and the lined grooves look more prominent and strategically planned out. This ultimately looks like a stand that was designed for functionality rather than approximating the look of office furniture. Impressively, the 3M can adjust the width of its stand to over 9 inches. This allows it to easily support just about any kind of PC tower out there including ones used in high-grade server environments. While the wheels look identical to the previous model, they actually have sturdier breaks. This is useful as the 3M has a very high weight limit of 50 pounds, a size very few computers will ever reach even in more professional settings. The swiveling feature of the base is very smooth and easy to operate. It gives the sense that this stand has very well made internal components that can last a long time. The cylindrical arms are also extremely well stabilized. Despite their rounded edges, they firmly secure your PC tower very well and have smooth caps that prevent them from accidentally scuffing or scratching your computer. Final Thoughts: What Should I Buy? It would be easy if we could just name a #1 winner as the overall best computer stand but unfortunately that isn’t how this works. It all really depends on how you are planning on using your stand and what your priorities are. If you really care about visuals and have a more casual approach to your PC set up then the Monoprice Multi Media Stand is a no-brainer. It may not have wheels but it definitely will serve you well if you don’t plan on moving your PC tower stand much at all in the first place. It’s a great balance of style and durability. As for the following stands that both have a lot in common we have to say that the M3 Adjustable CPU Stand is our pick if you want something a little more mobile and practical. It’s essentially just a slightly more advanced version of the Kantek Mobile Stand but with higher quality wheels and swiveling functionality. The Kantek is quite good, but the 3M is truly impressive when it comes to its utility.